Neo-Metro was started due to a growing appetite for the sleek industrial design of Acorn Engineering’s (Neo-Metro’s parent company) stainless steel toilets and sinks. 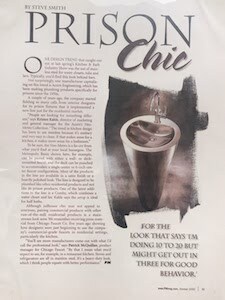 Homeowners, architects, and designers had created a new trend the media was calling “Prison Chic,” and we knew we could surpass their expectations. Today you can find Neo-Metro luxury products in some of the exclusive and trendy bars, hotels, museums, office buildings and nightclubs all over the world. These products can also be found in boutique hotels catering to sophisticated guests, museums, restaurants, sports arenas, dental offices, and celebrity homes. We invite you to join us in celebrating twenty years in business, and the vision and creativity of architects, designers, and building owners that helped make it all possible.